In the Civil War, George Henry Thomas, U.S. Army officer, received the sobriquet "Rock of Chickamauga" for saving a Union army. George H. Thomas was born on July 31, 1816, in Southampton County, Va. He graduated from the county academy and read law before attending the U.S. Military Academy (1836-1840). In Florida he won a brevet to first lieutenant during 2 years of action with the 3d Artillery against the Seminole Indians. He served at Southern posts until the Mexican War, in which he became a major after battles at Monterrey and Buena Vista. He was an instructor from 1851 to 1854 at West Point; in 1852 he married Frances Kellogg. He was major of the 2d Cavalry on the Texas frontier from 1855 to 1860. At the beginning of the Civil War, Thomas decided to remain with the Union and by June had been promoted to colonel, in command of a brigade in the Shenandoah Valley of Virginia. In August he became a brigadier general and division commander in Kentucky. He defeated a Confederate force at Mill Springs on Jan. 19, 1862, before moving into Tennessee with the Army of the Ohio. After promotion to major general, Thomas commanded the right wing of the Union advance on Corinth, Miss. He led a corps against the Confederate invasion of Kentucky in September. 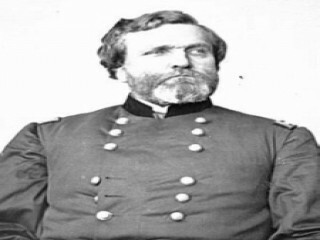 He went on to command a corps in the Army of the Cumberland during the battle at Stones River, Tenn., in December and January, and during the Tullahoma campaign, which forced the Confederates into Georgia in the summer of 1863. When the armies met that September, the Union right collapsed, but Thomas held on the left to save the army and win the nickname "Rock of Chickamauga." In October, 1863, Thomas became a brigadier general in the regular army. His troops stormed Missionary Ridge to win the battles around Chattanooga on November 23-25. Thomas led the Army of the Cumberland throughout Gen. William T. Sherman's Atlanta campaign from May through September 1864. In October Sherman assigned Thomas to meet the Confederate advance into Tennessee. On December 15-16, outside Nashville, Thomas routed the Confederates in the most complete field victory of the war. He became a major general in the regular army on March 3, 1865. From 1865 to 1868 Thomas commanded the military Division of Tennessee. He refused promotion to lieutenant general in 1868 because it resulted from Reconstruction politics. He assumed command of the Division of the Pacific in June 1869 but died in San Francisco on March 28, 1870. View the full website biography of George Henry Thomas.